We know there is limitation that by default we can get maximum 5000 records in a single web service call but by using paging cookie concept we can get more then 5000 records. Sharing sample code how to use it. Please refer the below URL for details. Sharing sample code to retrieve data using Web API and using FetchXml to build the query instead of oData. In this example, I am retrieving contact based on email/mobile no and calling function form an entity’s ribbon button to validate duplicate record. To use FetchXml, we need to format FetchXml in usable Web API service endpoint format. We do this by storing the FetchXML in a variable and encoding the string with the encodeURI function native to JavaScrip as below. Another point, if you want formatted values to be included, then you need to set request header like below(This is mainly used to get Lookup, OptionSet, DateTime specific formatted value like lookup text value). In one of requirement, we wanted to use CRM Data for reporting purpose but due to some limitation with FetchXml (like N-N relationship) we were unable to get desire data so we decided to use Data Export Service Add-ons to push into Azure and make use of data for reporting purpose. When we tried to install/Enable the Data Export Service from Dynamics Marketplace, the add-on installed successfully without any error but when we tried browse Data Export Service(Settings -> Data Export), it was showing blank page and Data Export Profile page was not displaying at all in IE 11 as below. We raised ticket to Microsoft and they suggested to add below URL in IE trusted site list and once we added these sites in trusted site, we were able to see Data Export Profile page(Settings->Data Export) as shown below. Note: In Google Chrome , It was working fine even without adding above URLs in trusted sites. Let’s say we want to attach some documents in Contact entity records. We can use out of box Import Data Tool to upload data/attachments into MS CRM 2011.To import attachment into particular record we need to identify a unique key for the record(let’s say for contact entity, it’s contact id i.e. GUID or any field which is unique). Below is the step by step procedure to import attachment for contact’s record. Step #1 Go to Data Management ->Templates for Data Import -> Select Note and click on Download. Step #2 Edit the downloaded template as shown below. Title: This would be Title of attached file. File Name: File name of the attachment. Mime Type: Type of attachment like text/plain. Regarding: Reference of record’s field name. In my case I have selected Contact’s Full Name. Document: Document Id of attached file. Owner: Owner name must be the CRM user. Below are some guidelines for file size and folder structure. If you want to Import multiple files in one Import session, you can .zip them together. A .zip file can include files of .csv, .xml, or .txt file types. All files in a single compressed file must be of the same file type. Any .csv, .txt, or .xml file must not exceed 8 MB. Any individual file inside the .zip file must not exceed 8 MB and the total size of the .zip file, including the Attachment folder, must not exceed 32 MB. You can choose any of the above file formats and give it as an input to the Import Data wizard. The delimited .txt, .csv, or XML Spreadsheet 2003 format files can be easily created by using Microsoft Office Excel. In my case, I followed this “ZIP folder that contain data files and one Attachment folder directly under root” i.e. Step #4 Import the ContactImport.zip file using Import Data feature (Data Management ->Imports). Step#6 Select “SampleDataMap” and Click Next. 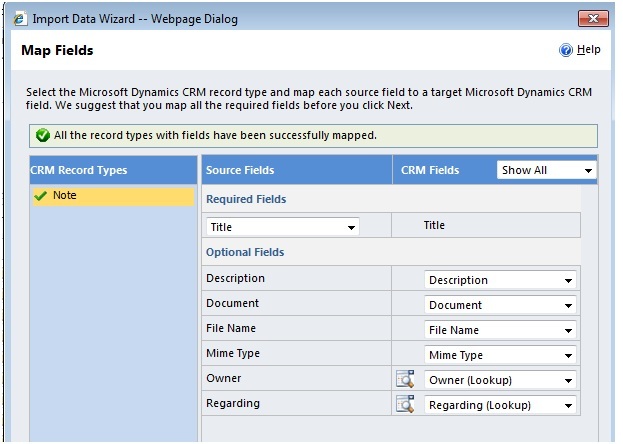 Step#7 Select “Note” for Microsoft Dynamics CRM Record Types and Click Next. Step#8 Select mapping fields from CRM Fields as shown below and Click Next. Step#9 Select Allow Duplicates “No” and Click Submit. You can write Data map Name for future import. Step#9 Data has been submitted for import. It may take time based on size of data. Step#10 Please check the contact record for attachment. One of our client wanted to move CRM Server from One Data Centre to different data centre but due to some constraint we could not move it by creating New Organization or by new deployment. We had only left option was update IP address manually. Recently we moved our CRM Server from one data centre to new data centre due to which IP Address of both Application and Database Server was changed. We had updated new IP Address in Registry(MSCRM–configdb,database,LocalSdkHost,metabase,ServerUrl,SQLRSServerUrl), Application Pool, Web.Config and custom application. But even after updating new IP address on above section we were getting the following error. Actually It was still referring Old IP Address at some places. To resolve the issue we enable the trace log and get CrmServerReportInformation with help of “Create File” option of CrmDiagTool 4.0 and came to know that DeploymentProperty Table(Column Name- ADSdkRootDomain, ADWebApplicationRootDomain and AsyncSdkRootDomain) of MSCRM_Config was still referring old IP Address. We have updated this column with new IP Address as below and everything start working fine. Data migration and data import use common entity model and messages. However, there are some important differences in the feature sets of the two operations as shown in the following table.